Back to one of my favourite stamps. A nice sunny colour unlike the weather outside. I stamped and coloured the Roses are Red (Honey Doo Stamp) image three times. I then cut them out and arranged them down the centre of the card. The sides needed some pattern so I selected a Sue Wilson embossing folder from my stash and Voila!!! 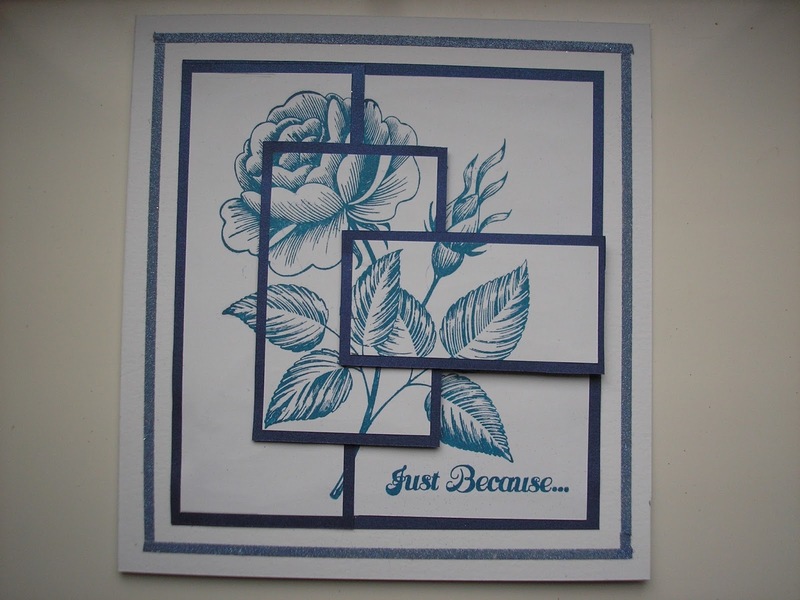 I stamped this image several times then carefully cut into it so that I could mat and layer the pieces back to form the card. I do love this stamp. 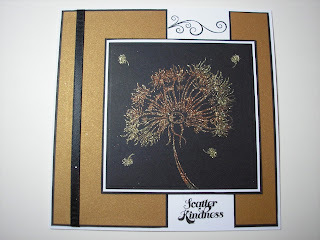 A change this week, I have used the Delicate Dandelion from Honey Doo Stamps with gilding flakes for the topper on this card. A very simple technique which I do not use often and need practice with. A very simple design I think you will agree. Glad to share with you my creations once again. 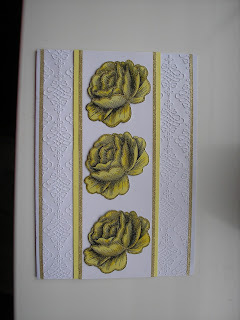 This is a card I made using the Floral Chaos stamp from Honey Doo Crafts. 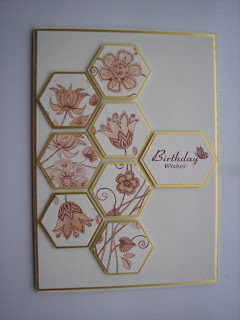 I wondered what to do for something different so I cut the stamp into Hexagons and took it from there. 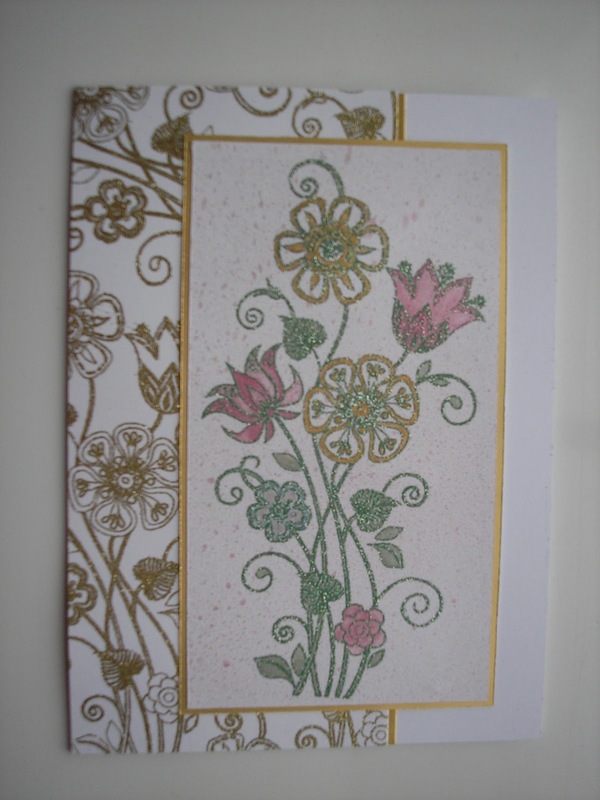 I painted the flowers with tea dye distress ink, matted on to gold mirri card. I am pleased with the result and hope yopu like it too. Welcome to any new bloggers and thanks to you all for sharing my blog. 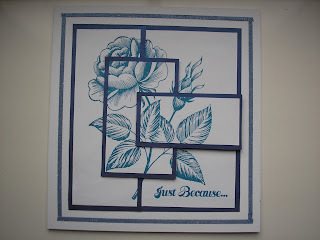 Well what a weekend!, I was invited to demonstrate at Stamp Magic yesterday, what a fabulous day. There were lots of visitors to our station, everyone so nice. Thanks to all who visited and heres to the next time. 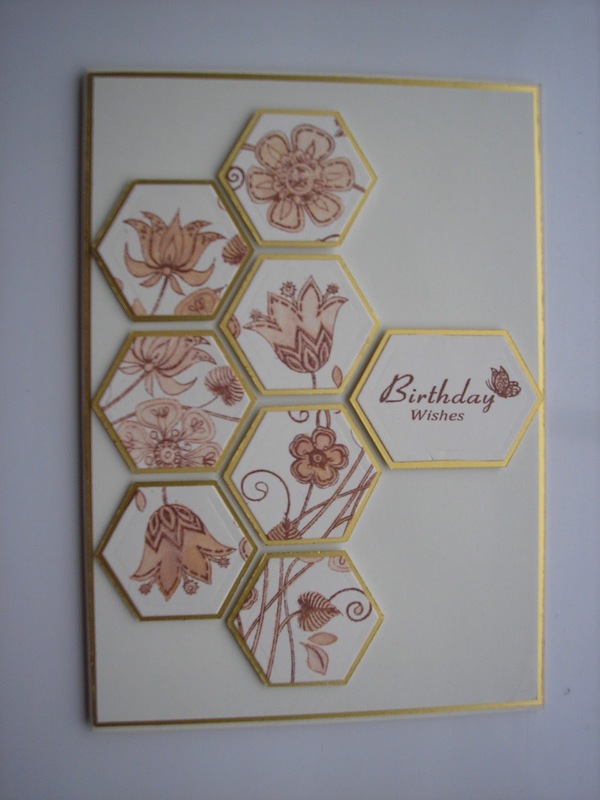 Well todays card was made for Honey Doo crafts with their new stamp Floral Chaos. I love this stamp. 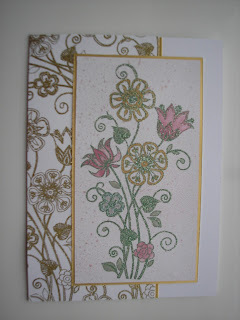 I actually had a go at sprtitzing over the main panel on this card with Honey Doo's Pink sapphire mica powder. I will have to thinks about that not to sure about it. 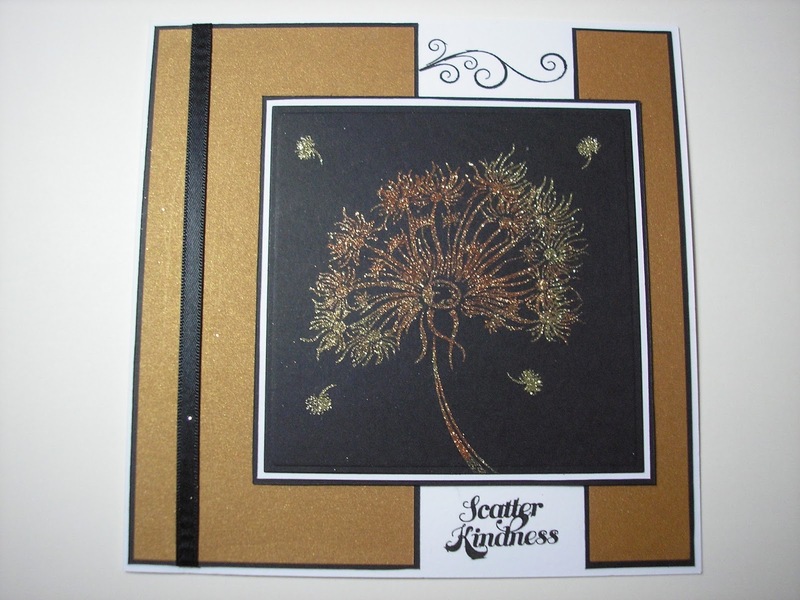 The background is stamped with the same stamp and embossed with Honey Doos Golden Glamour Embossing powder. I hope you like it. All card design are copyright to Janet Dockrill. Simple theme. Theme images by Jason Morrow. Powered by Blogger.